This is a special post not only because it is my 50th Aloha Friday, but also because it is about a place that is special in my heart: New York City. I’m writing and scheduling this from my house, but by the time you read it, I’ll be in NYC attending BlogHer 2010. Growing up, my father worked in the city and every so often we would get to go to his office. I remember excitedly riding the train and subway. As we walked down the streets of the city, my sister and I would twist our necks to see the tops of the gigantic buildings. (By contrast, years later, when B showed me her home city, I felt let down as I grew up thinking city = towering buildings.) When we got to my father’s building, we would run up the steps, through the revolving door, through the revolving door, through the revolving door…. well, you get the point. When we were done with the revolving door (or when our father said we were done), we would go to the elevator. Up we would go about twenty or so stories, the exact floor escapes my memory at the moment, and over to my father’s office. He had a big window to look out of and boy did the people and cars look tiny. Later, during college, I interned at a PBS affiliate in New York City, WNET. Before my first day, my father accompanied me into the city and showed me how to navigate from where my train would leave me off, through Penn Station, to the appropriate subway lines and to my building. Without his help, I’d have likely wandered around for hours on my first day. Thanks to his assistance, I hardly ever got lost. Just one time, really, when I almost boarded a train for New Jersey instead of one for Long Island… Oops! I know that BlogHer is going to be busy, but there is so much in the city that I’d love to do and see. I’d want to see the Museum of Natural History (would like to see it with NHL as well). I’d like to travel to the Lower East Side to get some of the best pickles around from NYC Pickle Guys. I’d like to catch a Broadway show and see Times Square. I’d like to visit Ground Zero, see the Empire State Building, see the Statue of Liberty and Central Park and …. Well, I guess you get the idea. Luckily, the city is a quick (relatively speaking) train ride from our house. Alternatively, we could visit my parents and take the LIRR from there into the city. While I don’t think we’ll get to see many sights in New York City on this trip, I’m sure we’ll have plenty of great memories of BlogHer 2010! 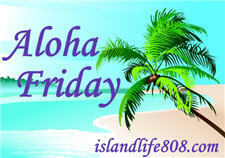 My Aloha Friday question for today is: Have you ever been to New York City? If so, what was your favorite thing to do/see there? If not, what would you most like to do if you got the chance to visit there? I love NYC! I lived in the Upper West Side for 10 years, and visit often. My favorite destination, hands down, is the Met; but my favorite thing to do is city walking and people watching.